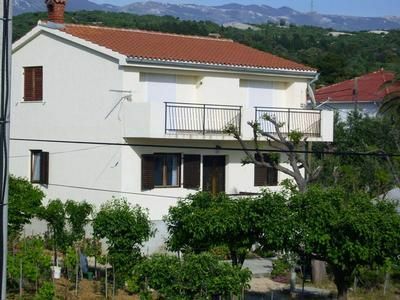 Only 50 m from this property in Barbat to the sea and the beautiful beach Vodenca is cca. 180 m. The 55 m² apartment on the first floor of the house can accommodate up to 4 people. In addition to living / dining room with kitchen, a guest toilet, bathroom with shower and two bedrooms are available. The apartment has satellite Tv and outside a furnished balcony, a furnished terrace with barbecue. Boat mooring you can book for the duration of your stay with. Pets are welcome. Only a few minutes walk away is the beach Vodenca with fine pebbles and concrete sunbathing areas. Restaurant is also nearby and the nearest shop is circe 1 km away. BOAT LODGING FOR BOATS UP TO 6 M.